A disaster epic, San Andreas is saturated with special effects and little else. 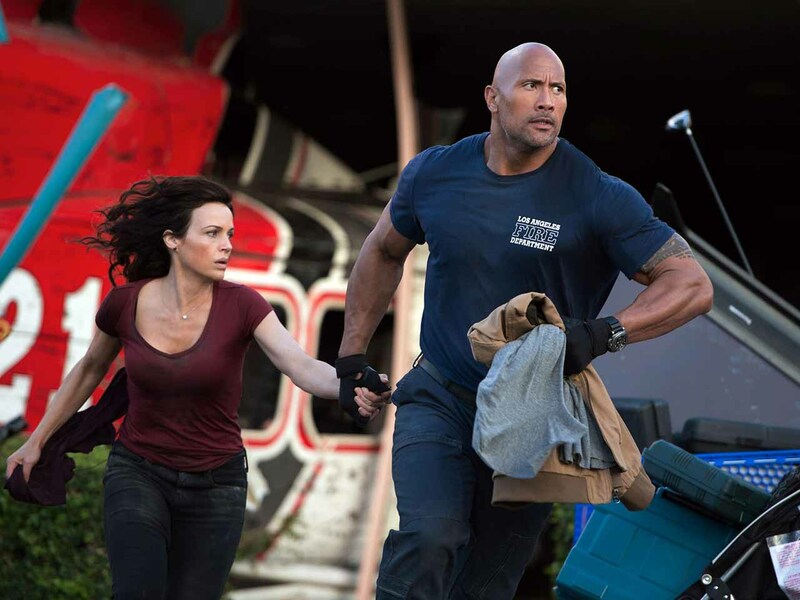 Los Angeles Fire Department Air Rescue Pilot Ray Gaines (Dwayne Johnson) is a devoted father to his daughter Blake (Alexandra Daddario) but going through a divorce from his wife Emma (Carla Gugino). Ray and Emma's marriage never recovered from the drowning death of their other daughter Mallory in a rafting accident. Now Emma is moving in with her new boyfriend, architect Daniel Riddick (Ioan Gruffudd). A massive earthquake destroys the Hoover Dam, where California Institute of Technology Professor Lawrence Hayes (Paul Giamatti), testing his earthquake prediction algorithms, barely escapes with his life. Soon major earthquakes start to hit the coast from Los Angeles to San Francisco. Dr. Hayes does his best to warn people to flee the cities. Ray attempts to rescue his wife in Los Angeles, and then tries to find and rescue Blake, who is stranded in San Francisco with two brothers from England, Ben and Ollie Taylor (Hugo Johnstone-Burt and Art Parkinson). Directed by Brad Peyton, San Andreas delivers exactly what it promises: mindless, methodical destruction on a grand scale, in many ways a re-do of 1974's Earthquake but with fewer characters and victims. Dams, bridges and buildings are knocked down with mind-numbing regularity, the CGI techs working overtime to create stunning graphics, equal parts awe-inspiring and science-defying. A narrow escape clocks in every ten minutes or so, and our hero Ray, his massive muscles flexing in synch with the earth shaking, does just the right thing at just the right second time and time again. While watching computer-simulated scenes of devastation is fun, with the tsunami scenes particularly effective San Andreas is aggravating in every other way. Ray appears to forget about his profession entirely and focuses singularly on saving his wife and daughter. A brief perfunctory scene where Ray waves random people to the relative safety of a stadium wall is thrown in just to remind us that the man's job is supposed to be about helping others, not steal helicopters, cars and boats to save family members. Worse still is the almost complete absence of suffering and mention of casualties. This is a film about the largest quakes in recorded history devastating two crowded cities. Yet hardly anyone dies, and the post-quake streets often appear to be conveniently deserted: plenty of debris and collapsed buildings, yet no bodies, no deaths, and only the most superficial of injuries. When the entirety of the Hoover Dam collapses, the event is shrugged off with a few "too bad" comments. No mention of casualties, and no follow-up related to the impacts of downstream flooding. Added to the to-be-expected shallow characterizations and stiff acting, San Andreas' bloodless aesthetic enhances a level of plastic artificiality that is difficult to stomach. This is destruction as pure tourism, the equivalent of advertising-saturated glossy magazine imagery to ogle at, free from any meaningful exploration of repercussions. San Andreas is superficial computer artistry devoid of emotional payoff, a childlike knocking-down of toys with no consequence.